Are you missing one or more teeth? 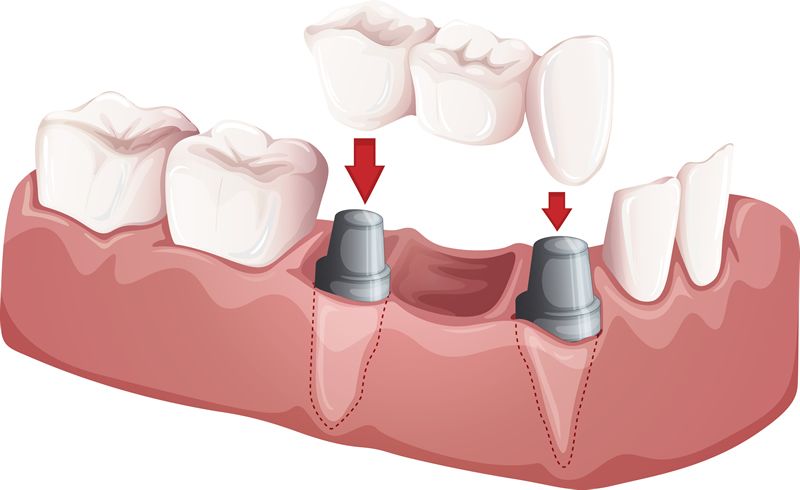 Dental implants can be just the thing you need to restore the feel, function, and appearance of your natural teeth. No bulky bridges, partials, or acrylic dentures that get in the way of your favourite meals. Dental implants use a titanium rooting device that accurately emulates the feel, function, and appearance of your natural teeth. Learn more about replacing missing teeth. Unlike typical dentures, there is no risk of bone or tissue loss when you choose a titanium implant. In fact, your bone will grow around the implant, creating an even stronger bond over time. 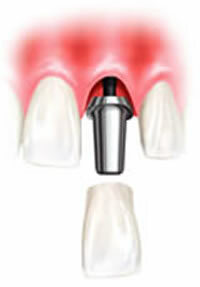 Once the implant has successfully integrated with the jawbone, a post (abutment) and crown can be permanently attached to the titanium root.Since your titanium-rooted implant can be fitted with a natural-looking crown or denture, your implant-supported appliance will look uncannily like the real thing. This does wonders in restoring the sensation, control, and confidence you’ve been missing after the loss of one or more natural teeth. Tooth loss not only affects your overall health, but can negatively affect your self-esteem and appearance. Neighbouring teeth often attempt to fill in the spaces of missing teeth, complicating the issue of having too much space between teeth — this can affect both your bite and smile. After a tooth has been extracted, the bone material can erode, causing additional structural and cosmetic deterioration. Implant-supported dentures use a titanium root device that mimics the feel and function of a natural tooth’s root. As such, implant-supported dentures do not have the wiggle and “clacking” effect of typical full dentures. The titanium root of implant-supported dentures eventually grafts to your jawbone and actually promotes new bone growth. Therefore, implant-supported dentures also address the issue of bone loss that is commonly associated with long-term denture use.Replacing your teeth with implant-supported dentures can greatly increase your comfort, smile, and confidence. 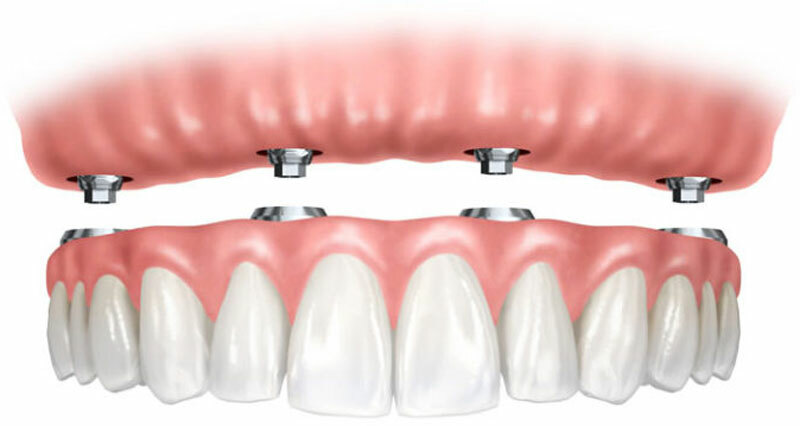 Recently, a new advance in implants has allowed the denture to be supported using the “all on four” technique, where the denture can be placed at the point of each arch support. This allows the implants and temporary crowns to be placed on the same day as the extraction. Implant-supported crowns and bridges are available at Dentistry on Wilson. They offer better support, stability and security for the crown or bridge, they preserve bone structure and they can go indistinguishable from the rest of your teeth. These options can be discussed with your North York dentist to find out what’s the best fit for your case.